Hello butternut squash risotto! Oh, how I love you so! Risotto is PROBABLY one of the best comfort foods ever invented. If not THE best. If you’ve never had it before (or made it yourself! ), I’ll let you in on a little secret. It’s YUM-MY. Savory, creamy. Hungry yet? Risotto is a dish I never thought I’d be able to make at home. I really thought it was only meant to be found in fancy restaurants. But guys, it’s really easy to do! It just takes a tiny bit of patience, and actually, it’s nice to just let your mind wander while you’re stirring it at the stove. This is a lazy-relaxing-Sunday type of dish. Best made when it’s chilly or rainy out or somewhere in between. OR, whenever. Nobody’s judging here. However, in Seattle, it’s cold and winter-y and rainy here this time of year. And really, this dish helps me cope with that. It’s warm and yummy in ma belly. I will (do/did) take a nap after I eat this. You should, too! Naps are good. Place a medium sauce pot on one oven burner. Fill it with 4 cups broth/stock and set it on low heat. Put a ladle – or heat-proof 1 cup measuring spoon – on a spoon rest next to the pot. Place a large heavy-bottomed pot on another oven burner. Set it to medium and start melting 1 tbsp butter. Keep a wooden mixing spoon nearby, also on the spoon rest or cutting board. For a truly yummy risotto, be patient and taste as you go so you get the perfect soft-but-still-slightly-chewy texture! Pick a high-quality broth. Because, flavor. Pick a low-sodium broth. Because then you can control the salt levels to your own preference. It’s cheap. If you’re cooking on a budget, it’s really inexpensive but still seems fancy! It’s versatile. It’s a blank canvas. Go nuts! 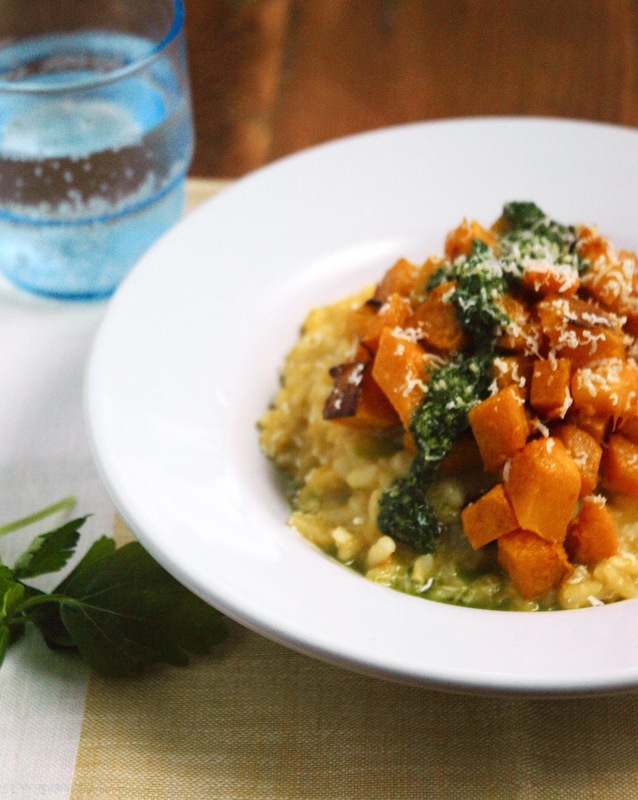 I paired this simple risotto with some roasted butternut squash (because I <3 it!) but really you can mix in whatever you like most. Sauteed mushrooms and peas? Yes. Tomatoes, basil, fresh grated Parmesan cheese? Yes. These are just some ideas, guys, the list could go on and on. BUT, the best part about this rich and delicious dish has to be the bright and cheery (can a sauce be cheery?) fresh Lemon Herb Sauce that I quickly zipped up in my mini food processor. It really brightens up the mood on this whole dish, and makes it truly special. One-of-a-kind. Plus, it’s beautiful. And simple. It’s almost pesto but even simpler than that. It’s just got garlic, herbs, lemon zest, lemon juice and olive oil. I got the idea for this sauce from a restaurant nearby. They had house-made pesto and bread on the table when we were seated. It was the greenest, smoothest, garlicky-est, most lovely pesto I’ve ever had. That color though. Get creative with your lemon herb sauce guys! You can use pretty much any leafy fresh herb you have on hand. And lemon zest. ALWAYS zest your lemons, because it’s like free flavor you can add to any dish. Before you slice that lemon.. ZEST IT!!! Okay, I’m done. Go ahead and make this risotto dish. Or make your own creation inspired by this one. 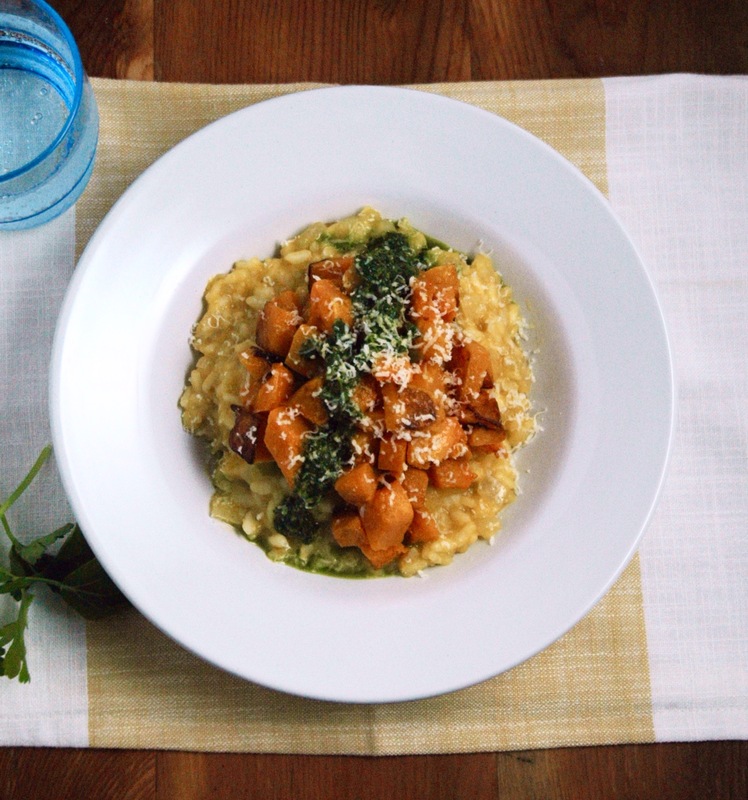 Creamy risotto topped with rich roasted butternut squash and finished with a bright lemon herb sauce. A simple yet decadent dish! PREP: Preheat oven to 400 degrees. Peel and chop butternut squash, chop onion, clean and chop fresh herbs, zest lemon, peel and dice garlic. ROAST: Toss butternut squash with 1 tbsp olive oil, salt and pepper and place on a baking sheet. Roast in the oven for about 30 minutes, or until tender and starting to brown, tossing once after 15 minutes. RISOTTO: Heat broth in a small saucepan over low heat. In a separate medium saucepan, melt butter over low heat. Once butter has melted, add onions and a pinch of salt and cook, stirring occasionally, until softened (about 10 minutes). Add white wine, turn heat up, and simmer until reduced by half. Add rice and stir until combined completely. Add 1 cup of hot broth to the rice. Stir and simmer over medium-low heat until the rice has absorbed all of the liquid. Add another cup of hot broth to the rice. Repeat these steps until the broth is gone and the rice is cooked (al dente). LEMON HERB SAUCE: Add all ingredients into a food processor and pulse until mostly smooth. SERVE: Portion out risotto onto each plate. Place a heaping amount of butternut squash on top of risotto. Drizzle the Lemon Herb Sauce over the whole plate. Finish with freshly grated parmesan. Be careful when you are peeling the butternut squash, it's a bit tough to do but so worth it. There is NOTHING like roasted butternut squash. Risotto cooking method adapted ever so slightly from Amanda Freitag's The Chef Next Door cookbook.